At the beginning Children of the Fire stood above the others. Children of Water bent before them, but the creations of Earth and Air didn’t want to surrender. That’s how the first war of the Four elements began. The war proved that Children of Fire couldn’t become equal to the Forgotten. Armor strength and combat training meant more than the ligature of the magic words. That’s why children of Earth and Air won the battle: their military skill overcome the trick on the enemy wizards. The governor of the children of Fire Archmage Vagrot, decided to take a desperate step. He went down to the very center of the sphere of Existence — and appealed to those who do not have names. Nobody will ever know what he offered to the Nameless and what their answer was. But the next morning the whole nation of children of Fire disappeared. Mages of the remaining elements did not find an explanation for what happened to the Fire, and named their disappearance the Curse of Vagrot. But nothing lasts forever. New trouble came from the depths of the Sphere. After a thousand years after their disappearance Children of Fire, that become Damned in that distant day, returned. Returned changed by the Nameless. Children of the Flame turned into demons — a mixture of fire and eternal icy darkness. Darkness has changed not only their body but also the soul, filling them with hatred for all the inhabitants of the surface. Legions of Vagrot of Thousand faces are chained by the iron discipline. For any disobedience there is one punishment — death. For cowardice — death. For treason — death. And when we say death we don’t mean fast and clean killing but a long and painful destruction or horrible death during ritual ceremonies of Snake summon rite. The structure of each legion extremely simple: an ordinary can become a foreman, the foreman — a centurion, the centurion — a leader of the thousand. Each of them is obliged to unquestioningly obey the orders of superior officers and no one can disobey Vagrot. The one of thousand faces takes all the decisions himself. He does not have councilors among demons; he listens only to the hissing snakes that bring the wisdom of the Nameless from incredible depths. 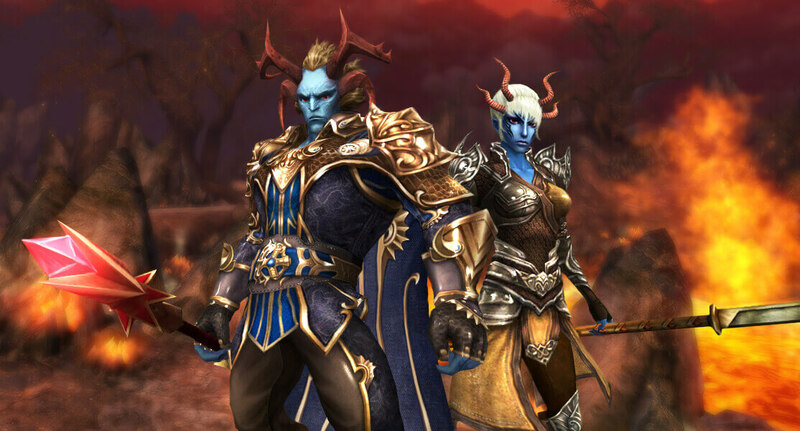 Two of the greatest Vargot’s followers, Isgaaru and Ghar are exactly the same servants as all the rest of the demons. In the presence of the master they’re humbly silent, listening to his creepy voice. Altar of the One with Thousand faces — a huge throne of shining basalt decorated with rough, but no less horrific images of the Nameless. Vagrot rarely rises from his throne. His body was changed monstrously in the unimaginable depths of the Sphere and is poorly adapted for movement on the surface. But the will of the Eternal Executioner is strong and unshakable, and the mind is infinite. He’s almost a god, an absolute monarch, and all the other demons are his tools, his slaves. Just as he Vagrot of Thousand Faces is the slave of Nameless. Nationals of the Eternal executioner believe in him only his original and only master. Their gods are the Nameless, terrible and incomprehensible creatures of Primordial Darkness. The will of the Lords of the Deep oppresses the soul of demons flaming with dark fire, guides them, leading to a single and terrible goal. To the glory of the Nameless demons construct monstrous temples decorating them with the skulls of their dead enemies. Shamans of the Snake Legion held grim and solemn rites there, calling poisonous snakes from the depths of the Sphere to hear the orders from their sleeping lords. During these terrible rites they sacrifice captured prisoners and their own warriors guilty in some infractions. Fresh blood attracts snakes to the surface, drums show them the way, and hot flesh imbues them. High Shaman — the Vagrot of Thousand faces himself, commander and spiritual leader of the accursed nation. His word is the law. His teaching — is undeniable. Demons believe in their mission, in the goal of Darkness. They believe they are called to clean the surface of the Sphere of the filth of Light. Their goal is to put an end to the existence of other races. Their religion is the destruction and chaos, their element is greedy, always hungry fire. While they are hiding, waiting for the right moment. While the drums and sorcerers are silent, while poisoned swords are sheathed, and black-and-red flags hovering only above the gloomy strongholds of Tyr Twayd. But soon, soon everyone will hear roar of the marching pipe and horny hordes will rush in all directions, and the temples decorated with skulls will rise on the scorched lands, and shamans with hoarse voices will herald the victory of Vagrot, Eternal executioner and the watchdog of the Nameless!